First off, thank you for your ongoing commitment to our work. 2017 took our movement back to our roots…to 1977—eight years before PCUN was born. The stratospheric fear of ICE arrest has put resistance at the center of our community organizing once again. As we look at head to 2018, we are going in with momentum—a strong community response and growing electoral energy. But they have momentum, too. Trump’s ICE activity and barrage of policy attacks on our community have them believing 2018 is their moment to roll back progress. So we’re—again—planning to give our all to re-doubling the community’s resolve and organizing community power to fend off attacks and to make progress, especially on the state and local levels. “In 1978, we caught Woodburn Police in the act of leading INS agents to houses on our block. We later confronted the Police chief; he walked out of meeting when we told him we’d sue if we caught them doing that again. Fast forward to a few weeks ago. Plain-clothes ICE agents came to a home in Woodburn with an arrest warrant. ‘He no longer lives here,’ the residents told them. ‘Do you have documents?’ the agents asked. One resident called 911. Woodburn officers arrived and asked ICE agents to wait outside while they searched for the individual ICE had come for. ‘He’s not here,’ a Woodburn offer told ICE. ‘We suggest you leave now.’ The ICE agents drove off. That day, we saw a fulfillment of Woodburn Chief Jim Ferraris’ commitment to ‘community policing’. With our sister organization, APP, we helped elect a Latin@ majority to the Woodburn School District board—a first for Oregon—including one seat decided by 87 votes out of 1,905! We helped pass several pro-worker pro-immigrant policies including: Cover All Kids, Fair Work Week, Protect Immigrant’s Privacy, End Racial Profiling, Reproductive Health Equity Act, and Ethnic Studies Standards. In 2018, we will build on these victories. We’ll campaign all-out, if needed, to defeat a looming anti-immigrant ballot initiative, to help win permanent status for Dreamers and “TPS” holders and to grow the ranks of progressives—especially Latin@s–in public office. Our movement has always drawn strength from looking ahead. Our goals and plans in 2018 also include some important shifts to better position us for today and tomorrow. One of these major shifts is my transition to the CAPACES Leadership Institute as its new Executive Director. The political moment we are living—our electoral victories and resistance of the administration—has invigorated and broaden our base like no other time we’ve experienced. This calls for a greater focus on boosting our leadership development work to maximize our collective impact. 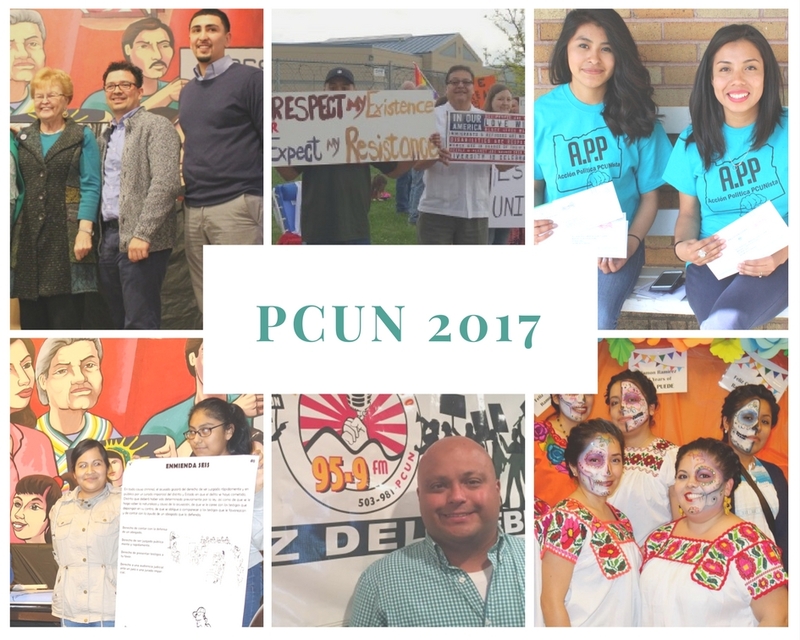 Concurrently we are working on restructuring PCUN to more strategically activate our growing base of leaders to continue building real political power that brings justice and equity for our Latino, immigrant, and farmworker community. Stay tune more on this in the new year. We deeply appreciate you commitment to our work and we’re hoping we can count on your continued support to sustain the fight, insist on progress, and to draw strength from our shifts. PS: Because we are a union, donations to PCUN are not tax-deductible. You can support PCUN’s education, research, and legal-defense work via a tax-deductible contribution to the Willamette Valley Law Project.